We have a little time before my friend Shirley arrives in Bangkok. After pondering the decision we decided we liked north better than south. I am secretly hoping that some of the rain and humidity that we have been seeing in Bangkok will decrease. Most likely a complete fantasy as it is rainy season everywhere in SouthEast Asia right now. Asia is such an assault to the senses. I am used to traveling in countries where extreme poverty and wealth live right next door to each other. Where fresh and perfectly prepared food can be served outside on a folding table right next to a pile of trash. 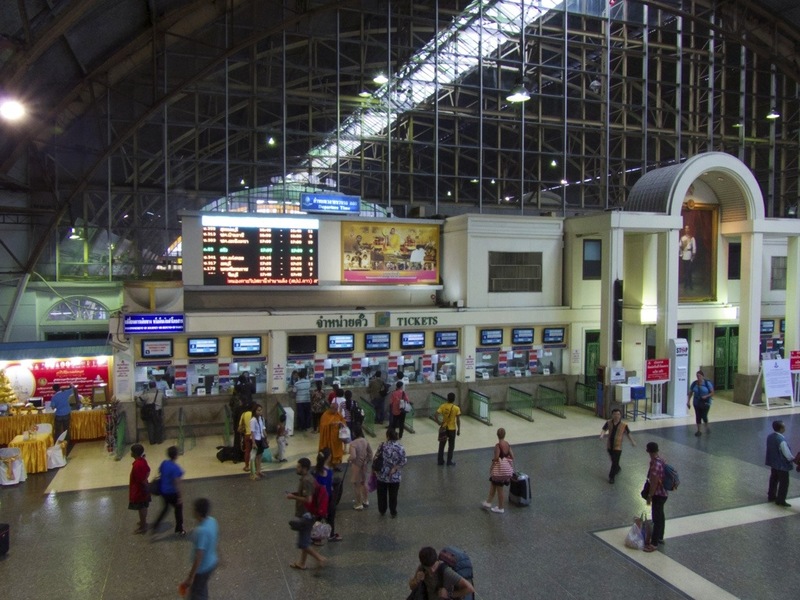 The most extreme versions of those combinations are found in the big cities like Bangkok. I am hoping the Chiang Mia will be a little smaller and perhaps a little more mellow. Finding and boarding the train were all surprisingly easy and civilized. When I compared it to Europe Michel laughed and said I had been away from Europe too long. There is a large board in the train station that displays the gate. When your train shows up on the display it is ready to board. Your car and seat number are printed on your ticket and there are helpful people at each door when you board. They sell drinks and food on the train but at tourist prices. 320 baht for coffee and a sandwich. We arrive at our seats and met the gentlemen who would be bunking above us, all of whom spoke perfect French. Le conversation a commence. The train does not go very fast and I had a wonderful night either snuggled next to Michel in his bunk or sleeping soundly in my own. The country side was serene as the sun rose and the train rolled by. Clouds curled around the hills and floated over rice paddies. We passed many small towns that we long to explore later this year as we take our time in the north of Thailand. For now it was nice to get a glimpse of what looks like their peaceful and pastoral lives. Sounds like an adventure traveling by train and sleeping on the train. 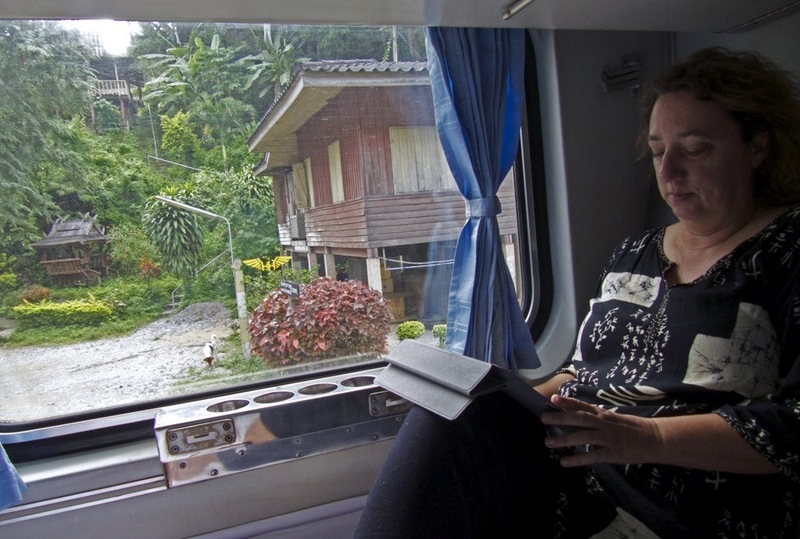 We traveled by sleeper train in Europe when Joshua was a toddler and I was pregnant with Connor and sleeping on the train was soooo very uncomfortable….. not the romanticized hollywood movie experience I had pictured. But still glad we did it. And how is your French…. are you able to follow Michel and others conversations a bit? It all sounds wonderful. Glad you arrived safely. Loving your blog! I love a train…clack clack clack. I took one across the US in the early 70’s and after 2000 miles didn’t want to get off. I rode coach and slept in my seat. Ate fruit out of my carry-on basket and drank herb tea all the way. I mixed my own tea in those days and was confronted by the porters who thought it was pot! ha. I successfully proved that it was indeed herbal tea. lol. 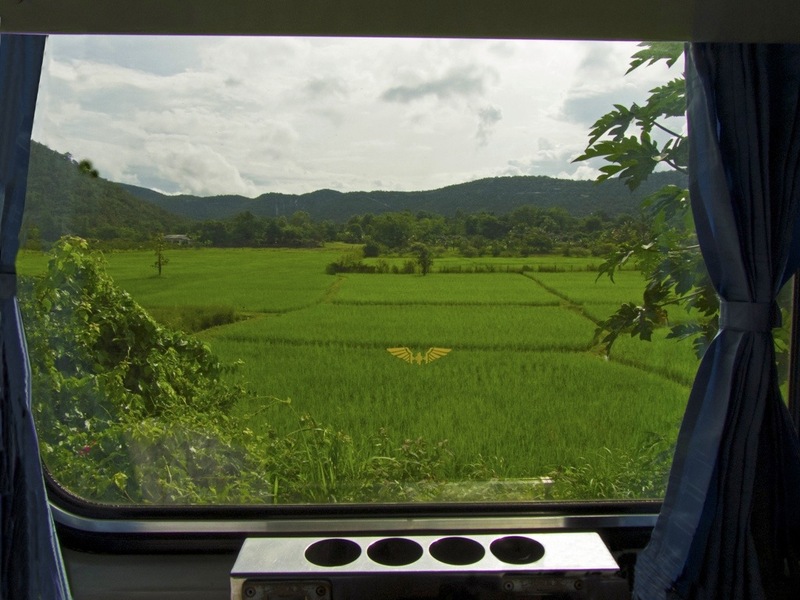 I couldn’t afford the dining car, and it is interesting that the fare on the Thai train is not in any way less expensive. $10 for coffee! What a rip! And how did the coffee taste? Was it good espresso or typically weak American style? 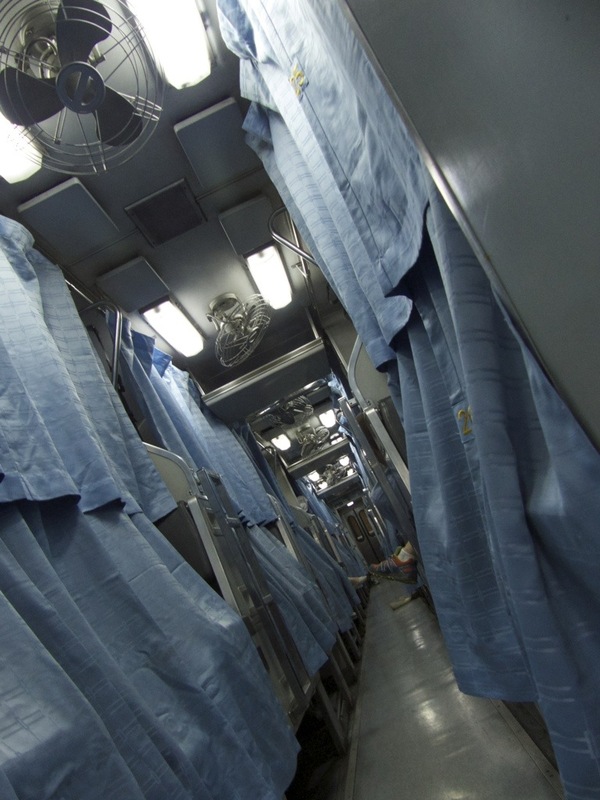 Were your bunks clean? I imagine that if they weren’t you would have mentioned that. It makes me nervous sleeping where other unknown people slept. I look forward to hearing the sights, sounds and tastes of the new locale! Such a great adventure! Everything was pretty clean. Coffee was not good enough :).